An interview with David Thomas and Dan Crow, producers of the Pat Garrett Western Heritage Festival. Dan Crow and David Thomas at the KRWG-FM studios. 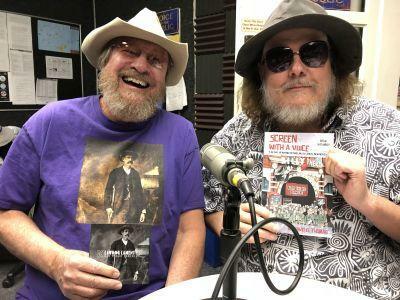 Las Cruces, NM – On this edition of PUENTES a la comunidad, bridges to the community, host Emily Guerra met with producers of the first “Pat Garrett Western Heritage Festival,” New Mexico historian and author, David Thomas, and singer and songwriter, Dan Crow. 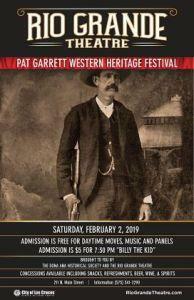 Both are members of the Friends of Pat Garrett, of the Doña Ana County Historical Society, and created the festival celebrating Pat Garrett and his legacy. A gallery opening reception at 5 p.m. Friday, February 1st will kick-off the event at the Rio Grande Theatre, 211 N. Main Street in Las Cruces. The festival continues Saturday, February 2nd at noon with live music and ballads about outlaws, a trial testimony reenactment, and old movies. Thomas will talk about the history of movie theaters in Las Cruces and present the 1930 film “Billy The Kid,” which premiered on October 12, 1930 at the Rio Grande Theatre. The schedule of events is available at www.patgarrettwesternheritage.com; the Friends of Pat Garrett at www.friendsofpatgarrett.com; and the Doña Ana County Historical Society at www.donaanacountyhistsoc.org.